Spanish scientists have sequenced the genome of the Iberian lynx (Lynx pardinus), currently one of the world’s most endangered felines. They have confirmed the “extreme erosion” suffered by its DNA. The Iberian lynx has one of the least genetically-diverse genomes. It is even less diverse than other endangered mammals, such as the cheetah or Tasmanian devil, or birds, like the crested ibis or osprey. The study, being published today in the scientific journal Genome Biology, has been coordinated by scientists from the Doñana Biological Station (CSIC). Several researchers from the CNAG have contributed to the study. In particular the sequencing and assembly of the genome was done at the CNAG and also the annotation of protein-coding genes was done in collaboration with researchers at the CRG. This is the first mammal genome of reference generated entirely in Spain. The project, financed by Banco Santander and managed by the Fundación General CSIC, has integrated the efforts of 50 scientists from research groups of 12 institutions, two of them from outside Spain, that cover a broad range of disciplines, including bioinformatics, genomics, oncology, evolution and conservation. The scientists have managed to read and organize 2.4 billion letters of DNA from Candiles, a male lynx born in the Sierra Morena lynx population, who now forms part of a program for breeding in captivity. To do so, they have used new sequencing techniques and developed innovative procedures to generate a high-quality draft genome on a limited budget. A total of 21,257 genes were identified, a number similar to that of human beings and other mammals, and they have been compared to those of cats, tigers, cheetahs and dogs. 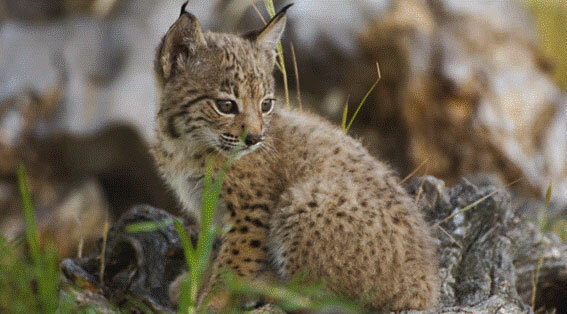 Researchers have found evidence of modifications in genes related with the senses of hearing, sight and smell to facilitate the adaptation of the lynx to its environment, which have enabled them to become exceptional hunters specialized in rabbits as prey. With the aim of studying the history and genetic diversity of the species, analysis was conducted on the genomes of another ten Iberian lynxes from Doñana and Sierra Morena, the only two surviving populations on the Iberian Peninsula, which have been isolated from each other for decades. Researchers have also completed a comparative analysis with a European lynx, to discover the bonds between the two lynxes that inhabit Eurasia. The Iberian lynx began to diverge from its sister species, the Eurasian lynx (Lynx lynx) some 300,000 years ago, and the two species became completely separated some 2,500 years ago. Throughout that period, they continued to cross-breed and exchange genes, probably in the periods between glaciations, when the climatology allowed the species to spread and encounter each other on the Iberian Peninsula and in southern Europe. The demographic history of the Iberian lynx has been marked by three historic declines, the last of which took place some 300 years ago, decimating its population. In addition to this, there was a drastic drop in the number of specimens in the 20th century due to its persecution, the destruction of its habitat, and two major viral epidemics suffered by the rabbit, its main food source. Scientists have interpreted these demographic drops as the cause of the low levels of diversity observed, and warn that this could impair the lynx’s capacity to adapt to changes in its environment (climate, disease, etc.). Furthermore, existence of multiple potentially harmful genetic variants has been confirmed, which could be contributing to the reduced survival and reproduction rates of the species. This genetic deterioration is especially marked in the Doñana population–smaller, and isolated for a longer period–which has half the genetic diversity of the Sierra Morena group. Nevertheless, the study reflects the situation before the exchange between the two relict populations and their inter-breeding in captivity were begun. These measures, taken within the Iberian lynx conservation program, have led to improvement of the species’ genetic situation in recent years. The use of new genomic resources, within the framework of the project, will contribute to optimizing management aimed at preserving the greatest genetic diversity, in addition to diminishing these populations’ genetic defects as much as possible. In addition to Doñana Biological Station (EBD-CSIC) and CNAG, also taking part in the project were the Centre for Genomic Regulation (CRG); the Spanish National Cancer Research Center (CNIO); the Evolutionary Genomics Group of the Hospital del Mar Medical Research Institute (IMIM); the Institute of Evolutionary Biology (IBE, CSIC-UPF); the University Institute of Oncology of Asturias (IUOPA); the Institut de Biotecnologia i de Biomedicina, the Department of Cell Biology, Phisiology and Immunology, and the Unit of Cell Culture of the Autonomous University of Barcelona (UAB); the Biological Research Center (CIB-CSIC) and the Catalan Institution for Research and Advanced Studies (ICREA). Furthermore, the project has received the cooperation of a team from College of Veterinary Medicine of Texas A&M University and the Bioinformatics Research Center of the University of Aarhus (Denmark).